Club members pose with their tree decorated with donations for the local Backpack Program. This month we would like to congratulate the Lucky Sprouts 4-H Club for being awarded the Nebraska 4-H Club of the Month for March 2018. This club from Aurora, Nebraska, in Hamilton County, has truly made a difference in its community. The club is dedicated to building strong citizenship and teamwork through various activities. The Lucky Sprouts 4H Club works hard on community service projects. 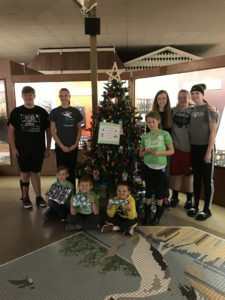 In December 2017 they decorated a Christmas tree at the Plainsman Museum in Aurora, Nebraska. The Plainsman invites community organization to decorate a tree each year and then hosts an Open House displaying all the trees. Each year that the Lucky Sprouts decorate a tree, they choose a theme for their tree that supports their current community service project. This year the Lucky Sprouts supported the Backpack Program in Hamilton County which provides school supplies for needy families. The program also sends a backpack of food home with students on Fridays to ensure that they have food to eat over the weekend when school lunch is not available to the student. The backpack provides food the student’s entire family. To decorate our tree, each member brought some school supplies that they used to decorate the tree including rulers, crayons, pencils, pens and paperclips. Each member also brought specific food items to be used by the Backpack Program which were wrapped up as gifts under the tree. Once the tree came down in January, the food items and school supplies were donated to the Backpack Program. The Lucky Sprouts also serve concessions at the 12th Street Cinema in Aurora every second Friday of the month. The 12th Street Cinema is operated primarily by volunteers in Aurora, which allows them to keep the prices very low and provide a way for families to have fun in Aurora. No Comments to "March Club of the Month"